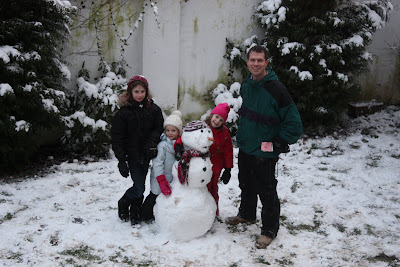 If you are an avid reader of the blog, you will remember our first Winter here where I warned the girls that it doesn't snow here like it does at home. We had a light dusting of snow that the girls referred to as a "Christmas Miracle." Well, let me rephrase. There are some winters where it doesn't snow like it does at home. This was not one of them. It has snowed and snowed, and snowed. Frankly, it has snowed so much that we are getting tired of it. 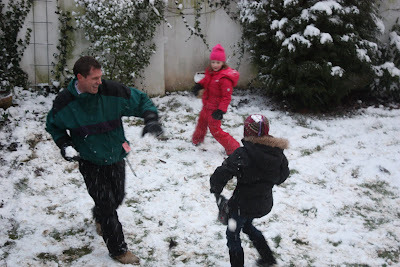 But, last weekend, Greg and the kids enjoyed what we hope will be the last major snow. They built quite the snowman, even by Michigan standards. I have been trying to remember to write this for a couple months now and I keep forgetting. I found three gray hairs on my head over the Christmas break. I have named them. They will be called Bailey, Avery, and Bryn. I'm hoping there will not be too many more to follow real soon. There will not be a picture of this! So, my friend calls up a couple weeks ago and says that she is thinking about taking her two oldest daughters to Istanbul for the weekend. She asked if Bailey and I might be up for accompanying them. I was first a bit apprehensive but Greg thought it was a great idea. So, we booked our tickets and plans began to be made for our most interesting trip to Turkey. It all started to be weird when my friend tried to check in for her flight and couldn't. We realized after much confusion that the tickets we had booked on Turkish airlines (US site mind you) were for 1:15 AM instead of PM. This is the day of travel by the way. So we called up, tried to figure out what to do, and alas we got it figured out to leave around 3:30 PM. Great, we got there with no problems and then found out our flight was delayed an hour, then two, then more than two. But, they wouldn't tell us what the problem was. We had to have somebody translating for us from Turkish to English. There was a rumor going around our gate that a German plane bound for Turkey had a bomb threat. I called Greg and asked him to look up on the Internet and see if there was any truth to this. The main headline for MSNBC said there were 120 terrorist suspects rounded up in Turkey. We actually considered cancelling the trip but Sally's nephew was meeting us in Istanbul from Barcelona. When he text paged us that he had landed, there was no turning back. We can laugh about this now that we are home safe and sound. We finally got out of Germany and arrived in Istanbul. Thank goodness Sally had her blackberry with her so she could stay in constant contact with the shuttle service/hotel. We felt so blessed to have our shuttle guy there with a sign with our name on it when we walked out of the airport. We stayed in a beautiful hotel, the White House Hotel. I highly recommend it. The staff was incredible. 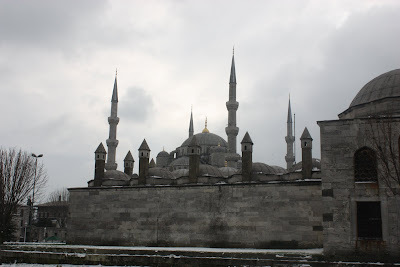 The location was awesome, about two blocks from Hagia Sofia and the Blue Mosque. We had good food every time we ate, which seemed like a lot. Saturday morning we were up and out early to take a tour...Hagia Sofia, Blue Mosque, slight detour for carpet presentation, and ending at the Grand Bazaar. Our tour guide totally knew what he was doing when he took us to the "carpet presentation, because the children would enjoy seeing how the rugs are made." Yes, we ended up making a purchase or two. Then, we moved on to the Grand Bazaar. While we knew bartering would be the process for anything we were interested in buying, still it was tiring to have everyone try and get you to buy things. They kept calling the girls "Barbies" which was very funny to the girls. We had to take a break at Starbucks, not very authentic, but it was a blizzard. No Joke. I think it was the most snow they have had in a long time. Figures. There were so many people (grown-ups) playing in the snow. 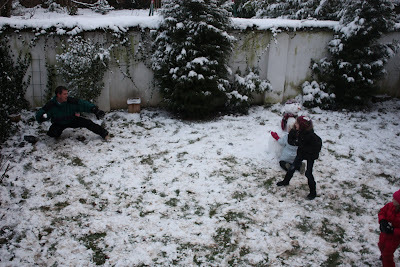 Snowball fights, building tiny snowmen, etc. You typically don't see this kind of behavior from Michiganders who have snow every year for months and months and months. Fun none-the-less. The girls had a blast in the snow. We finished out the day at the Spice Bazaar, which was a more quaint food oriented Bazaar. Back at the hotel, the girls decided to put on a fashion/dance show for us. It was most interesting and fun for them. The adults found it quite entertaining and humorous. Sunday came too early as we were all a bit tired and slow moving. We started at the Basilica Cistern which is an underground water cistern that the Romans built. The water was brought to the cistern via aqueduct. Really cool. We had to go back to the hotel to drop Mike off (Sally's nephew), his return flight was a little earlier than ours. In the afternoon, we debated about what to do. We did lunch first at a great authentic place with very memorable baklava. We decided to go the the Archaeological Museum because they were supposed to have an Alexander the Great Sarcophagus. Turns out, it was a sarcophagus with scenes from Alexander the Great's life but it was not the sarcophagus of Alexander the Great. The big highlight of the Museum was a huge Trojan Horse that the girls were able to climb up into. We didn't have time to go the the Topkapi Palace after we exited the museum. And to be honest, we were all a bit tired. I'm not sure we could have handled another site. Next time we are in Istanbul, we will still have a couple of things to do. Since I have been home, people keep asking me if I felt safe. I can honestly say that I never felt any anxiety whatsoever about our safety. We felt perfectly at ease walking the streets of Old Town which is where we spent our time. Definite highlights of the trip include the absolutely amazing Hagia Sofia (Church turned into Mosque). The call to prayer we would hear from the Mosques several times per day was very cool. The Mosques, themselves, were so huge (so much bigger than I ever imagined). And, just being in a city with such a long, rich history was truly a Humanities Major's dream. You can't go anywhere else in the world to a city that borders two continents, and has been a capital city of three different empires (Byzantine, Roman, and Ottoman). Another huge highlight was the opportunity to have some mom/daughter time with Bailey. We rarely get to spend some time together away from the other kids. I would love to go back in the summer to see if the city seems different. I think there would be a different energy to the city in the warmth. However, if this was my only opportunity to see Istanbul, I'm so glad I had the chance. Thanks to the Conleys for inviting us along because I really think this was one of the most unique travel experiences thus far. And, a big thanks to Greg, who held down the fort with three little ones while I was away. Y3W34 - "Tis no normal life, Wyatt, there's just life"
While this week was as close to normal as it gets, there was more snow than usual. Bailey's class went sledding every day. Can I take a minute and express how much I love a teacher that puts acedemics on hold for an hour, when it is snowy, so the kids can have some fun! Way to go Mrs. Frost-Ohm. 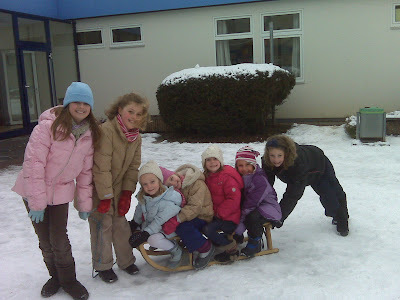 For most of these kids, there is never enough snow to sled, so when she sees an opportunity, they take advantage of it. Couldn't we all use a little more fun in our lives? I say that because every bit of time I had this week was looking at available houses for sale in Michigan, or making arrangements with packers, realtors, etc. I have expressed a couple times when things have frustrated me this week, "I can't wait until life is normal again." Then I remember that no matter where I am, there will still be things that frustrate me. 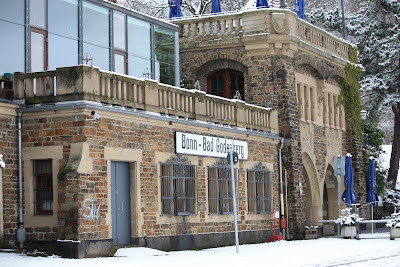 This weekend we dropped Bailey off at her art class and went downtown Bonn. We are really feeling the push to do everything we have wanted to do but haven't gotten around to yet. 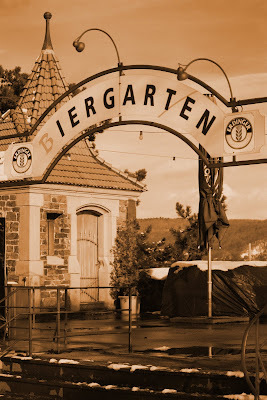 Greg took some pics of Bonn, so we can remember what fun it was so many Saturdays. I am so glad that we didn't have to start school on Monday. The girls didn't start until the 6th (Wednesday). I think we needed the extra couple days to get ourselves ready. So, it is now 2010. I wonder what this new year will bring. Well, since I told Greg that I wouldn't start worrying about the move back to the US until January, I'm pretty sure it will bring some moving anxiety. I started bright and early on Monday morning on realtor.com. We started scheduling the moving company. Greg talked to the respective Ford and Cartus people about what we needed to be doing to be ready for the move. You may think that this seems a bit premature but the time is moving so quickly. I'm glad we are getting a jump start. We started reading Junie B. Jones Books in the evenings along with the kids reading books. We read, "Junie B. Jones is Not A Crook," and at one point Bailey, Avery, and I were laughing so hard that I could hardly finish reading the book. 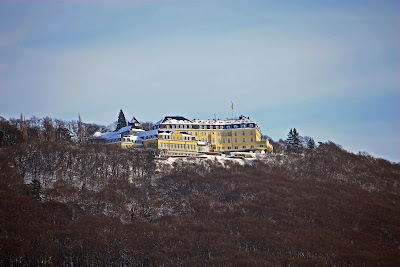 We had quite a bit of snow this week, an unusual amount for Bonn. There was enough for the girls to build a tiny snowman. Ahh, the joys of winter. I think this is one of many reasons the girls will love to go home. Bryn refers the movie "Up" as "Chunky Boy" (referring to the little boy in the movie, Russell). I have no idea where this came from. Bailey was in the bath washing her hair while I was trying to get the other girls dressed. All of a sudden, there was a huge glob of soap suds in Bryn's hair. I asked how in the world that got there and Bailey said, "Oops. I must have flailed." She has a history of flailing. But, this was the first time I ever heard her admit it. So funny. Bryn was dancing and singing and when she got to the end, she raised both hands in the air for the big finale. When we started to applaud, Lleyton ran into the center of the room next to Bryn and held his arms up in the air just like Bryn. Then, he did it again and again waiting for his applause. Avery spontaneously started singing Michael Jackson's "Billie Jean," today only she sang "Baby Jeans is not my lover..."
It is so nice to have constant comedy in my life. 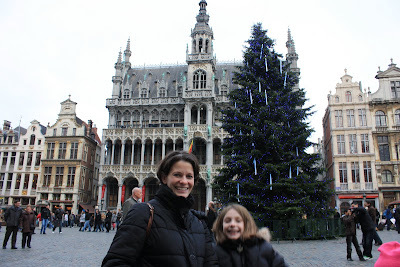 Y3W32 - Brussels, Flanders Field, and a Happy New Year! Christmas came and went so fast. 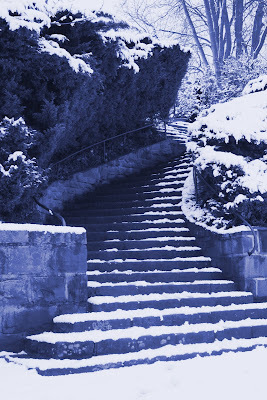 I must say that though we considered going to Munich with Ryan and Melissa after Christmas, we were really tired. I think we were all really glad that we didn't have to get in the car and drive so far. But, in our effort to not waste any time here in Europe (we have so little left), we had to go somewhere. 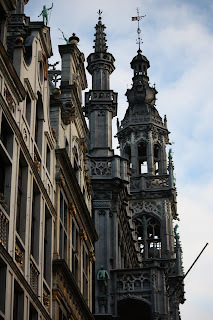 We decided to visit the cities and areas surrounding Brussels and Ypres in Belgium. Greg has been talking about going to Ypres for a couple years so we finally made it happen. 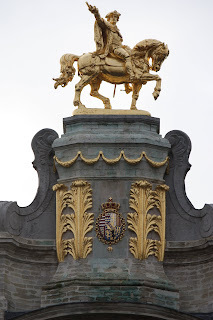 The last time we visited Brussels, there was a bit of restoration work ongoing. 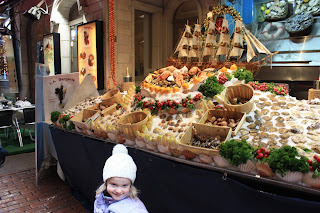 This time all the beautiful architecture was visible and adorned with wonderful holiday accents. 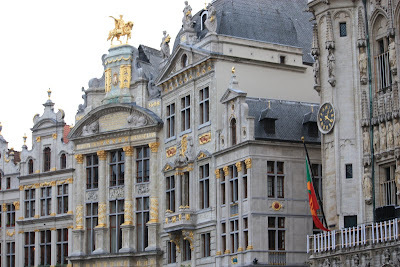 In addition to the Grand Place's elegant architecture and broad spaces, Brussels has quaint side streets filled with restaurants. It was funny to watch the hosts flag down potential patron after patron and then stand quiet as we walked by with our small (but cute) little army of children. 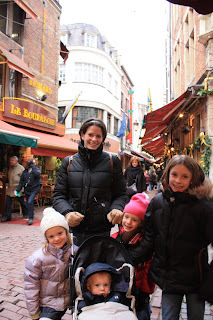 We also found time to find one of Brussels most well known sites, little Julien. He is often dressed in a fancy outfit, but for us, he was in his traditional birthday suit. 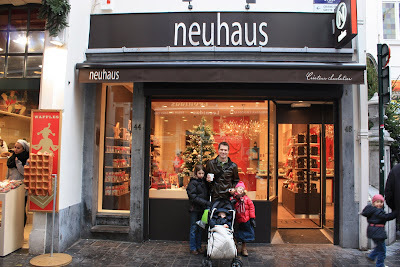 We went to the four recommended Chocolate shops (Neuhaus, Galler, Godiva, and Leonidas) to get a sample from each to have our own little Belgian Chocolate taste test later at the hotel. I have to say that I was very excited about this part of the trip. 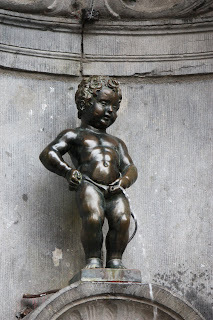 I love Brussels by the way. I can't really put my finger on what exactly I love about it though. 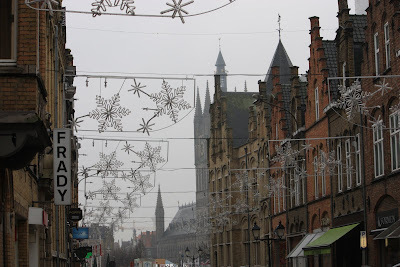 We ended up staying in Lille, France because we couldn't find a hotel closer to Ypres that had availibility for our family.. Apparently, Ypres is a hot spot this time of year. The weather was not ideal in Ypres, but we always find a way to make it work. Greg had done some research about some WWI trenches that are still there. Though it was very rainy, we had to see the battlefields. When do you ever get a chance to see that? And, I must say, despite the rain, they were very cool. The series of trenches that we visited where called Bayernwald because the landscape reminded the German soldiers of the Woods in Bavaria. They had pictures of both English soldiers and German soldiers who had fought there (including Adolf Hitler which was really interesting to see as a young soldier in WWI). The reason they have both English and German soldiers is because control of the trenches had changed hands a couple times. 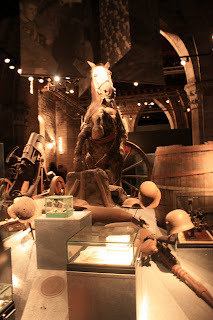 Then, we made our way to the Flanders Field Museum. Wow. If the building itself is not enough to wow you, then have an amazing experience inside. They give you cards when you walk in with a persons name on it. There are three different terminals throughout the museum that you can enter your card and it will tell you what the person on your card was doing at that time. Avery was very excited to have gotten Marie Curie as she had heard about her in school. Lleyton was a soldier from Chicago, who had six brothers who all were fighting in the war. All seven miraculously made it back to Chicago after the war. They also had a sister, who was in Europe involved in the War effort who made it back. Amazing. 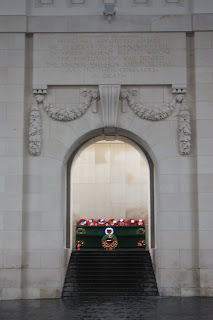 The Ypres salient is well known for it's five major battles throughout the Great War. A salient is a military term used to describe when a bulge occurs in the lines creating a situation when one army can be attacked from three sides. 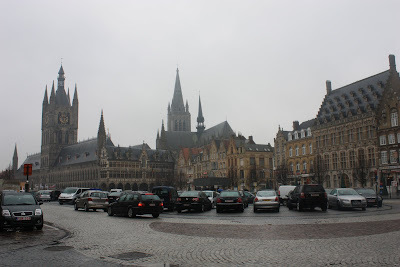 Ypres was the center of such a salient and the Allied forces were hit from the north, east, and south for several years leading to the complete destruction of the city. 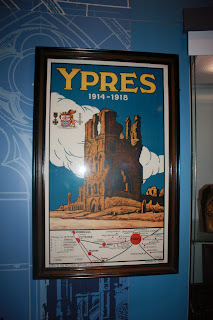 In one of the five Battles of Ypres, 140,000 people lost their lives to gain about 5 miles of territory. 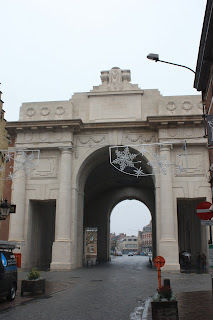 We took some photos of the War memorial called the Menin Gate which today marks a passage point through the town walls. The gate pays honor to more than 54,000 Commonwealth soldiers who lost the lives in Ypres and who's bodies were never recovered. 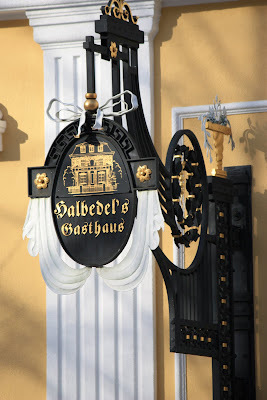 Every evening at 8:00pm, traffic through the gate is closed and six buglers play the last post. It was definitely enough of a trip for us. We spent the rest of the week and weekend just hanging out. Our first rest in so long.